Good idea! This guy is probably never going to waste money on a necklace. Itâs a permanent necklace, Sannon had inked around his neck. 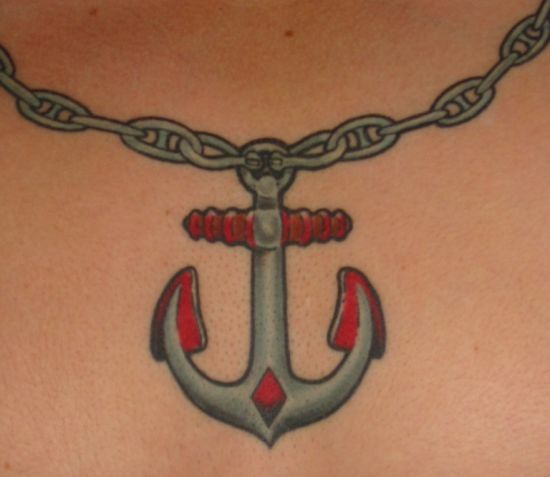 But I donât understand, why an anchor pendant hanging over there. Well, I guess, this guy is certainly fond of diving. Thatâs why he is very smart in keeping an anchor ready with him. So that he will never miss it out, or will never go missing in the sea. Lol! Each and every chain is painted with minute detail and care. The tattoo seems strong and stable like the real anchor.